Growing up, I thought pimento cheese was disgusting. I guess it was because the only kind I ever ate was from a plastic tub in the grocery store that had been sitting there for who knows how long. It was pink and overly mayonnaise-y, had no distinctive taste (especially not of cheese) and was just grody all around. One year, I went to a July 4th picnic and someone brought homemade pimento cheese — a revelation. You could see cheese in it, the pimiento wasn’t overpowering and it had a hint of garlic. That was the first time I realized there was another kind of pimento cheese. I’m not sure why it’s a southern staple (or why we spell it wrong), but you’ll find pimento cheese on menus and in homes all over the South. The classic way to eat it is sandwiched between two slices of white bread, but you’ll also see it stuffed into celery sticks, in grilled cheese or melted atop a burger. Yum. I prefer to eat it with something crunchy for texture, so I serve mine with Triscuits. Something about the salty crunch with creamy cheese just works. 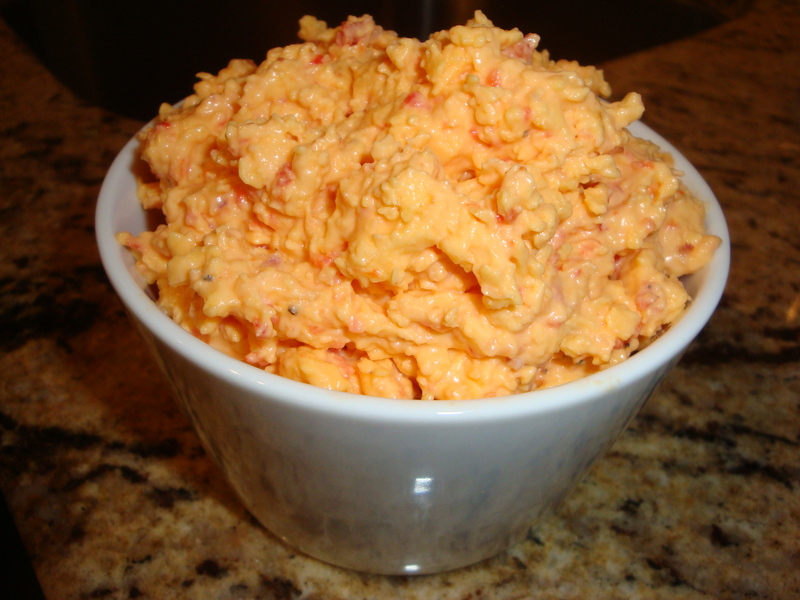 My mom started making pimento cheese at home a few years ago, and I’d nearly lick the bottom of the bowl. I snagged her recipe and now I make it when I know company is coming so we’ll have a snack for happy hour. It’s very important to freshly shred a block of cheese, instead of buying the pre-shredded kind. I rely heavily on my food processor both to shred the cheese and finely chop the onion and pimientos. It goes quickly that way. If you don’t have a food processor, no worries — just shred the cheese by hand, either grate or dice the onion, and chop the pimientos as finely as you can. Even though I don’t care for raw onion, a sliver of it and a dash of garlic are essential for flavor. If you think you hate pimento cheese, try this recipe and see if I can’t change your mind. Mix all ingredients together in a bowl. Cover with plastic wrap and let it sit in the refrigerator for a couple of hours. Serve with crackers, vegetables or on sandwich bread. I have had – and ABSOLUTELY LOVE – this Nancy-Whitney hand me down recipe – and was it a 4th of July at your family’s beach house when the introduction was made?? hmmm… love it. and love your blogs. think i’ll have to add an appetizer to tonight’s menu 🙂 thank you!